Sugar Talk and More is all about The Powerful Key to Lose Weight, Look Good and Feel Great! Host, Cathy Ormon is a Certified Health Coach, Published Author and Sugar Switch Guru. She has learned, through her own experiences and those of her clients, the ultimate way to control your weight and your cravings. And now, she is on a mission to share these principles of nutrition and healthy living with you so you can live a happy and healthy, and energetic lifestyle and reach your unique health goals! 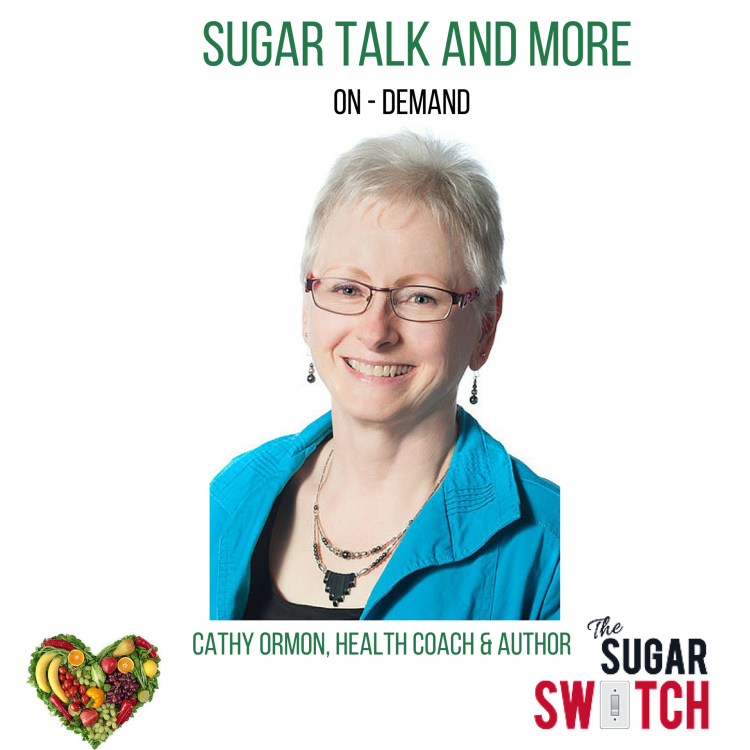 Sugar Talk and More will inspire listeners with education and strategies from Cathy and other health experts that will help you easily lose weight, increase energy, and live a healthy, happy, vibrant life, without chronic health issues! Cathy Ormon was first heard on TLR Station as a sponsored host of the CIBN. She was featured in two segments - this is part 1. Cathy Ormon was first heard on TLR Station as a sponsored host of the CIBN. She was featured in two segments - this is part 2. Do you love the summer heat but find that it can totally drain your energy? Keeping yourself hydrated is the key to beating the summer heat! Are you a busy person that needs convenient, nutritious food on the run? Maybe you’ve heard about the growing popularity of Green Smoothies, but you’d really like to know more about them. Today Cathy Ormon talks about Green Smoothies and how they can be power packed, nutritious ‘drinkable salads’. Cathy will talk about how to make them, and she will also explore the pros and cons of pre-packaged or commercial products, and protein powders. Cathy will share with you what makes a ‘healthy lifestyle’ and why a healthy lifestyle is so important. She will talk about which health issues can be avoided and/or reversed by making healthy choices. By the end of the program you will know the Ultimate 10 Tips to Thrive, and you can start benefiting from those tips TODAY! Have you noticed an increasing number of alarming statistics in the media about the negative effects of sugar and refined foods? Is it true or is it all just exaggerated hype? Are sugar and the refined foods we have come to love really THAT harmful for our health? Cathy will explore why sugar is a health hazard, and the confusion around sugar and refined foods. By the end of the program, you will have learned 5 steps you can take to eliminate the health hazards of sugar from your life. Brain Fog! Where does it come from? Do you sometimes find yourself in a mental ‘brain fog’ and wonder why? If so – you don’t want to miss this program! Join Cathy as she takes an in-depth look at brain fog, including what causes it and the host of other health issues that can accompany it. Cathy will give you 3 steps to completely eliminate brain fog from your life, that you can use RIGHT NOW! Life is busy, and your diet regularly contains many common convenience foods. They taste good, seem healthy enough, and your family really likes them. But recently you notice that you are starting to have some common chronic health concerns like weight issues, joint pain, and high blood pressure. You wonder what’s causing these annoying issues - it couldn’t be your diet, or could it? If this sounds vaguely familiar - today’s program is exactly what you need to hear! Cathy will be talking about how your food could either be healing you or harming you! She will give you valuable information about inflammation - the number one underlying serious health problem that can actually be controlled by the food you eat! Be sure to tune in to hear the 6 Steps you can take to heal silent inflammation and chronic health issues. Why Do I Have a Daily Energy Crisis? Do you drag yourself out of bed every morning? Do you feel like you have an energy crisis happening every day? You’re sure that you get enough sleep, you think you are eating well, your stress level is okay - but you still wonder what this daily energy crisis all about. If you can identify with this situation - you need to hear this program. In today’s program Cathy will analyze the body’s energy source: carbohydrates (carbs), why carbs are so important for you, and tell you the difference between healthy carbs and unhealthy carbs. By the end of the program you will have a simple 5 Step Plan To Beat The Daily Energy Crisis! Stop the Impulse Eating Runaway Train! Do you sometimes get caught in impulsive situations where you simply can’t seem to resist the temptation of certain foods, no matter what? Are you wondering what the negative impact is, and why it happens? You’re not alone! Impulse eating can feel like a runaway train – out of control! In today’s program Cathy will take a good look at impulse eating, why it happens and she will give you some solutions, including 3 important steps you can take to Stop The Impulse Eating Runaway Train. Do you feel as though you should have more stamina and overall pep? Have you had some type of injury or muscle issue that has been slow to heal? Has your physician expressed some concern about bone issues? All of these minor health concerns could be related to your body’s ‘Invisible Cornerstone of Vibrant Health’: Protein. Today on Sugar Talk and More Cathy will be sharing valuable information about protein. She will tell you why protein is truly the cornerstone of your health, how much protein you require, and the differences between animal protein and plant protein. By the end of the program you will have a greater understanding of why protein is your key to vibrant health, and Cathy will give you 2 Simple Steps to take that will ensure you are getting enough protein in your diet. The Best Way to Power Your Lifestyle! Are you looking for a simple way to be able to maintain a high energy level, deal with a lot of stress and maintain your perfect weight? If these are on your list of goals – you don’t want to miss today’s Sugar Talk and More program. Cathy will be talking about The Best Way to Power Your Lifestyle – through Exercise. Cathy will be talking about why exercise is being recognized more and more as a powerful tool for healthy lifestyle and healing. She will share with you how you can benefit from exercise. To get you going in the right direction Cathy will give you 5 Tips on The Best Way to Power Your Lifestyle with Exercise! Turn 'Flu Season' into Your BEST "Winter Wellness Season" Ever! Every year when fall comes and the weather goes from warm and sunny to cold and snowy, do you cringe in anticipation of ‘flu and cold season’? After listening to today’s show, you won’t need to cringe any more! On this episode of Sugar Talk and More Cathy will tell you how you can change ‘Flu Season’ into your BEST ‘Winter Wellness Season’ ever! Cathy will tell you about the immune system and the two things that impact it: free radicals and antioxidants. Before the program is finished, you will have 5 steps you can take, starting now, to have the healthiest and best ‘Winter Wellness Season’ ever! There’s so much confusion these days about fats: good fats, harmful fats, Omega 3 Fatty Acids, Omega 6 Fatty Acids and coconut oil. If you are feeling baffled about what’s what with all of these, you’re not alone! Tune in to today’s Sugar Talk and More where Cathy will straighten out the confusion. She will tell you the benefits of consuming good fats, and you’ll get the scoop on how to have a healthy balance between Omega 3 and Omega 6 fatty acids. Gorgeous Skin, Hair and Nails - It’s Easier Than You Think! Gorgeous, vibrant, young looking skin, hair and nails - something we all strive for! Are there times when you are concerned about your skin, hair or nails? Do you wonder what minor skin, hair and nail issues could be telling you? You’re not alone! In today’s program Cathy Ormon will talk about the 3 most common skin, hair and nail concerns, and what your skin, hair and nail issues could be telling you. Cathy will share with you two ways you can feed your hair, skin and nails – it’s easier than you think! Is Stress Making Me Fat?? Have you been on numerous weight-loss diets, but always end up feeling more stressed and heavier than ever? Do you wonder if your level of stress is related your weight gain? If these thoughts have gone through your mind, you need to listen to today’s Sugar Talk and More Program. Cathy will put the pieces of the puzzle together regarding stress, the body’s hormone levels and how those hormones can affect your weight. By the end of the program, you will have 6 stress busters in your healthy living toolbox that you can use starting right now! Emotions - They Can Drive You to Eat! Food is a central component of our social culture and our connection with others, as well as fulfilling our nutritional needs. But there are times when many of us turn to food even if we are not physically hungry in order to fulfill an emotional need for comfort or to relieve stress. Do emotions drive you to eat? If this has been an issue for you, or if you are simply curious about emotional eating – you will want to hear this program. Cathy will discuss the big issues of emotional eating and the triggers that cause it. She will also distinguish between emotional hunger and physical hunger. Then she will give you 5 positive steps to break the emotional eating cycle. Have you been feeling heavy lately? Would you like to ‘lighten up’ and lose the weight? Do you sometimes feel like your weight is stuck? Are you experiencing negative emotions, particularly regarding your weight? If you answer YES to any or all of these questions – today’s Sugar Talk and More program is exactly what you need! Cathy will be interviewing EFT (Emotional Freedom Technique) expert Marlene Cameron about how EFT can help you to Lighten Up and Lose the Weight. Marlene will share with you what EFT is, how EFT addresses emotions, and how it works in terms of weight loss and weight management. Marlene will also give you tips on how you can use EFT for yourself. This is a program you won’t want to miss! Escape the Trap of Cravings! All of us know what it is like to have food cravings occasionally. But when cravings start to happen more and more often, we can feel frustrated, guilty, and totally powerless – like we are caught in a trap! Today on Sugar Talk and More Cathy will talk about why we want and need to escape from cravings. She will dig into what causes us to crave certain foods, including a very big reason you might not have realized. Before the end of the program Cathy will give you tools you can use to escape the trap of cravings! Alcohol!!! Cheery Confidant or Atrocious Adversary? There is no doubt that savoring a glass of wine or downing a pint with friends is a great way to connect socially. But at what point does the ‘cheery confidant’ of alcohol become an ‘atrocious adversary’? There are a few health benefits to moderate consumption, but there are also many health risks and dangers that go with over-indulgence. Today Cathy will investigate the good, the bad and the ugly of alcohol consumption. She will talk about the benefits of cutting back, and share with you steps you can take now to limit or stop alcohol consumption to benefit your health in the long term. Christmas is the biggest and longest season of celebration in our western culture. It is a happy, social time and a time for family, friends and neighbors to connect with each other. The result of all the celebrating is that by New Year’s Day we can be feeling like we have a hangover. If Christmas celebrations have ever left you feeling headachy, bloated, irritable, and overweight with low energy - like a stuffed turkey – today’s program is for you! Cathy will talk about the specific elements that cause this kind of hangover, and the benefits of maintaining a healthy lifestyle through the Christmas Season. There is a 6 Step Plan that Cathy will share with you, so you will be able to dodge the Christmas Hangover, look good and feel great when January rolls around! Detox Diets - Dynamic or Dangerous? Detox diets and cleanses are very trendy these days, especially in the realm of alternative health. At certain times of the year, such as after Christmas and New Year’s or in the spring, many people seem to be inclined to do a detox diet. So what is this trend all about? What are the most common detox diets or cleanses? Are they actually safe and healthy, and do they really work? In today’s program Cathy will take an in-depth look at detoxing, including the pros and cons. Then she will give you some tips for the safest and most effective way to revitalize and refresh your body, so you can feel vibrant, energetic and healthy all the time. Get Into Your Groove with Greens! The color green is the in thing these days – for both the environment and for nutrition. On the nutritional side, ‘greens’ refers to green whole foods, including leafy greens and green vegetables. Greens are probably the most underestimated source of nutritional power! Join Cathy to discover the nutrition and the benefits of greens. By the end of the program, you will know 8 different ways to add greens to your lifestyle, and it will be easy to ‘get into your groove with greens’! Sugar - It Can Literally Give You a Break! Most people know that consuming sugar is harmful to their health. But what most people don’t know is that sugar can literally ‘give you a break’ – it can be the underlying cause of a broken bone! Are you feeling overwhelmed by everything you need to get done in a day? Do you find yourself too busy to eat healthy meals or have time with your family? Have you tried various ways to be healthy, but you are just feeling too tired and overloaded to sort it all out? If any or all of these questions resonate with you – you will benefit from today’s Sugar Talk and More Program. Today Cathy will interview Time Management Consultant Twyla Lapointe about the connection between time management and your health. Whether your time issues are related to your personal life or your business, you will come away from today’s program with a greater understanding of how your priorities, your choices and your actions can work together to reduce stressful busywork to benefit your health. Get a Handle On The 'Midnight Munchie' Habit! Do you often find yourself in front of the fridge or pantry looking for a snack late at night or right before bed? You’re not alone! It is a fairly common occurrence in many people’s lives – one that the big food companies count on and cater to. Why does it happen and is it healthy for you or is it harmful? If you’ve got the ‘midnight munchie’ habit and you’d like to get a handle on it – you will want to hear this program! Cathy will scrutinize the whole issue, including the most common reasons for the ‘midnight munchies’, the pros and cons, and how to get a handle on it. Then she will give you easy tips to keep the snacks as healthy as possible.